Picard representing the Federation. Dathon representing the Children of Tama. 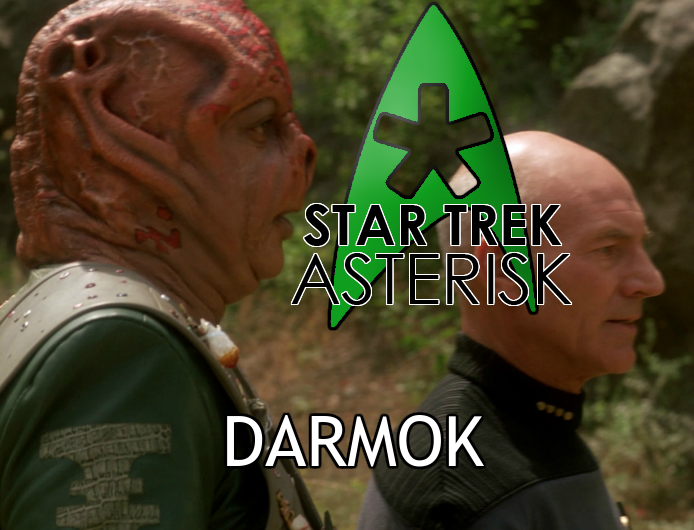 Darmok and Jalad at Tanagra. The beast at Tanagra! Shaka, when the walls fell. Picard and Dathon at El-Adrel. The Enterprise is on her way to the El-Adrel system to make contact with the Tamarians, a race of aliens who seem to have a language that defies the universal translator. 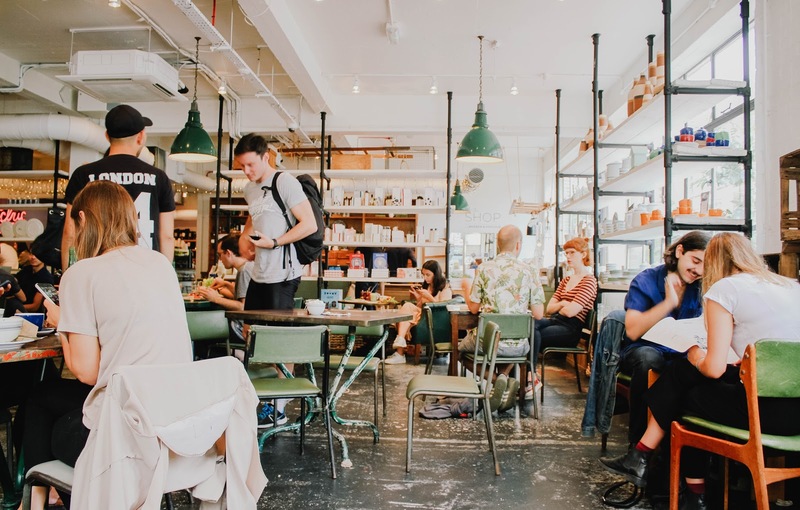 Picard's mission is to attempt to push past this language barrier without the help of a language specialist and open diplomatic relations with them. They meet up with the Tamarian ship, and, as expected, can't understand a word the captain is saying, except to presume that he's referring to a bunch of proper names and locations. Frustrated, the captain disarms his first officer of his knife, repeats "Darmok and Jalad at Tanagra!" and has his crewman beam him down to the planet along with Picard. A nice, friendly gesture. On the planet, the Tamarian captain tries to make Picard take a knife, but Picard, familiar with the story of James Kirk vs. the Gorn, refuses to fight the Tamarian captain. The miscommunication continues into the night. On the ship, Riker and the crew try to find some way to get Picard back. 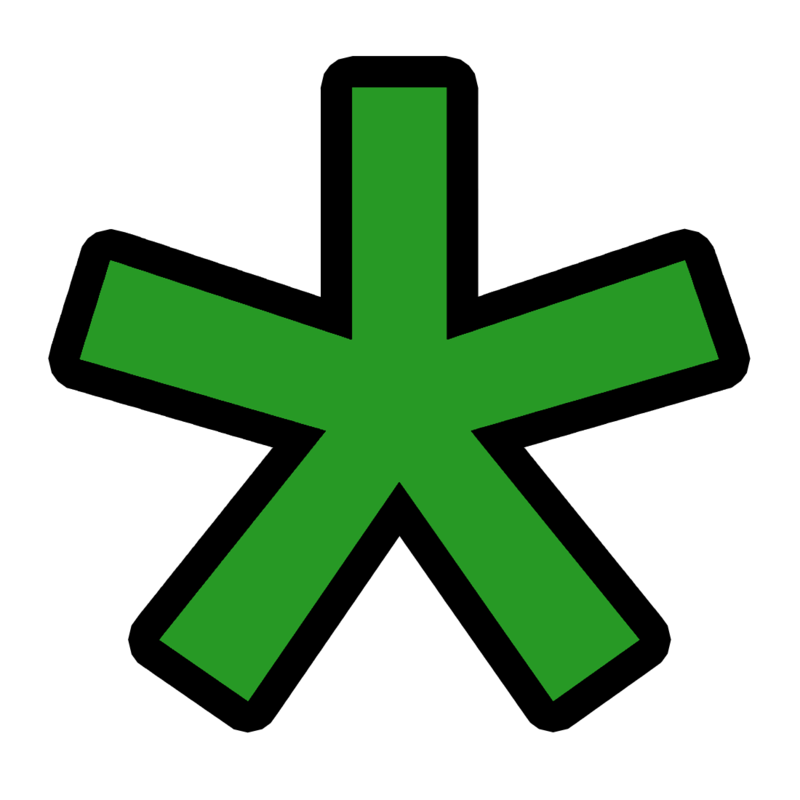 The Tamarians have projected a scattering field in the ionosphere, blocking transporters and communications, but allowing sensors to pick up life signs. Geordi thinks he can figure it out, meanwhile Data and Troi try to figure out the Tamarian language. As night falls on the planet, Picard makes his first breakthrough in the language barrier. He can't start a fire, so the Tamarian captain throws some fire at him and says "Temba, his arms wide." 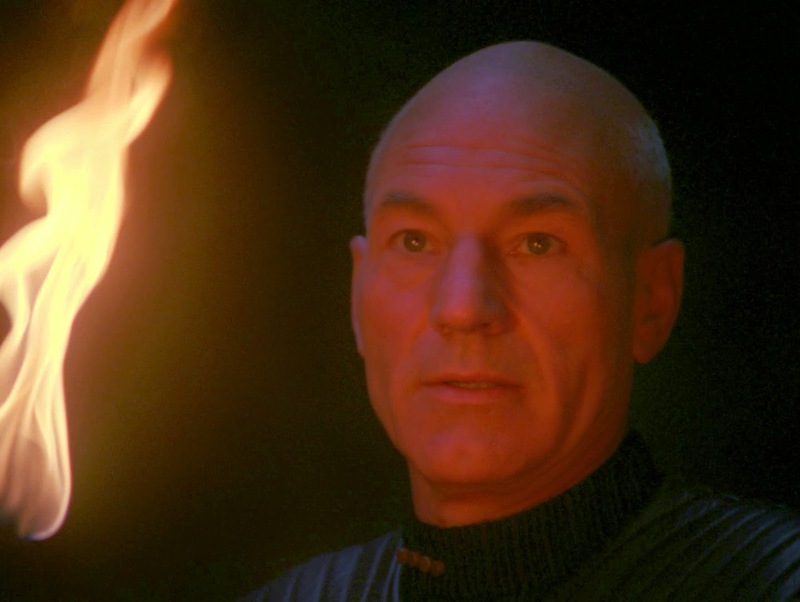 Picard reckons this means "take" or "give," or something, so he takes the fire that was given to him and thanks the captain. Back in orbit, Worf attempts to take a shuttle to the planet, but the Tamarian ship cripples the shuttle just enough so it wouldn't be able to take off once it landed. Worf is forced to return, and Riker is left to consider what crippling the shuttle instead of destroying it meant. Meanwhile, Data and Troi discover through the computer databanks that Darmok was a hunter on the island of Tanagra and deduce that the Tamarian language is based on the metaphor of their common mythology. This is something that Picard is simultaneously learning on the planet when the Tamarian captain runs up to him, presents the knife again and says "Temba, his arms wide!" Picard refuses to take the knife, unwilling to fight the captain, but when a beast appears in the distance, Picard understands that the captain doesn't want to fight him, he wants them both to hunt the beast. Back on the ship, the crew is coming close to a solution to beam Picard back up. Riker tells Geordi to hurry it up because they can sense that there's a third, powerful entity on the planet ready to attack the two captains. Meanwhile, Picard is muddling through a strategy with the Tamarian captain. "Uzani, his army with fists open! ", "Uzani, his army with fists closed!" Picard deduces that this means to lure the beast in and then attack. He's joyful at this understanding, but executes the plan as soon as possible. He attacks the beast, so does the Tamarian captain. The beast goes after the Tamarian captain, but just as Picard is going in to help, O'Brien begins to beam him up! O'Brien can't maintain a lock, however, so Picard remains on the planet. But he's too late. The beast runs away, and Picard finds the Tamarian captain mortally wounded. "Shaka, when the walls fell." 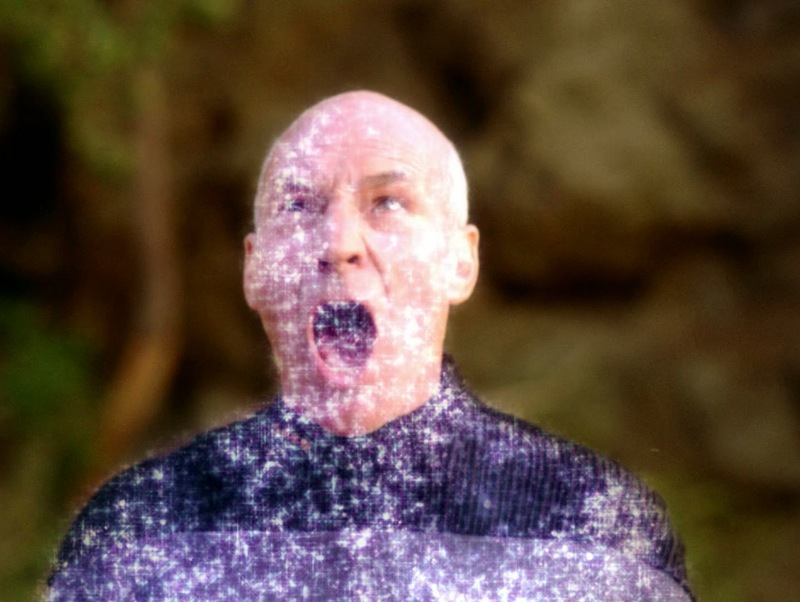 An image, Picard had earlier learned, of defeat, or failure. The Tamarians strengthen their scattering field, so transport is impossible. 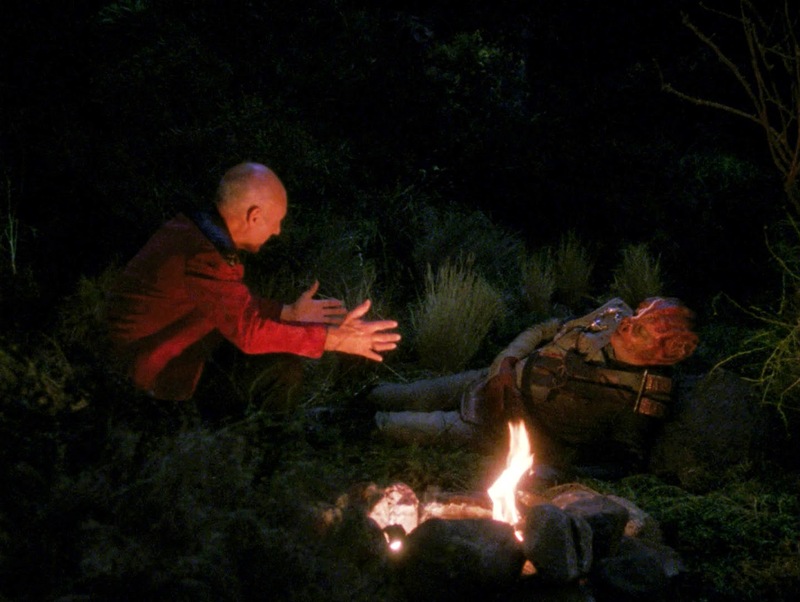 Night falls again, and Picard urges the dying captain to tell him about Darmok and Jalad so that he would have a greater understanding of the Tamarian language. Darmok and Jalad arrived separately on the island of Tanagra. Together, they hunted and fought a beast on that island, and they left as friends. Picard understands that it was the captain's intention to establish a friendship through a hunting expedition. The Tamarian captain then urges Picard to tell a story, so Picard tries to remember the story of Gilgamesh. Gilgamesh and Enkidu at Uruk; the two enemies who became friends through hardship, and then Enkidu died while they fought a beast together. The Tamarian captain is amused by the story, but sadly passes away. Washburn, by the Reaver's hand. It's not long before the Enterprise and the Tamarian ship realize that the Tamarian captain is dead. It's also not long before the beast returns to claim his prize. Picard stands to face the beast just as the Enterprise and the Tamarians get into a fight. During the fight, the scattering field is destroyed and the Enterprise is able to beam up Picard just before the beast gets to him. Picard rushes to the bridge and starts talking to the Tamarian first officer in his own metaphorical language. He explains that he and the Tamarian captain had become friends, they fought a beast, but the beast overtook the Tamarian. The first officer and crewmen pay tribute to their captain, and then Picard presents the captain's handwritten log, which they beam over. Picard then offers the dagger he used in the fight, but the first officer bids him to keep it. Naming the incident "Picard and Dathon at El-Adrel," they part on good terms. Later, Riker catches Picard reading up on ancient Greek literature, then Picard takes his dagger and, with it, pays silent tribute to his friend, Dathon. This is really an extraordinary episode, and a great one on which to open season five. Of course, "Redemption II" really opened it, but as far as a non-continuous story goes, this one set the pace for the season. This just might be the episode that solidified Picard's position as the diplomatic captain as opposed to Kirk's warrior captain. At the end, Picard mentions how establishing communication was more important to Dathon than his own life. He also says that he couldn't say whether the Tamarians were yet their friends, but if the rest of the Tamarians are anything like Dathon, then they are a perfect fit for the Federation. This is just a brilliant episode, and it makes me wonder how hard they worked to try and break the universal translator, or if this idea just occurred to them randomly. I love it.